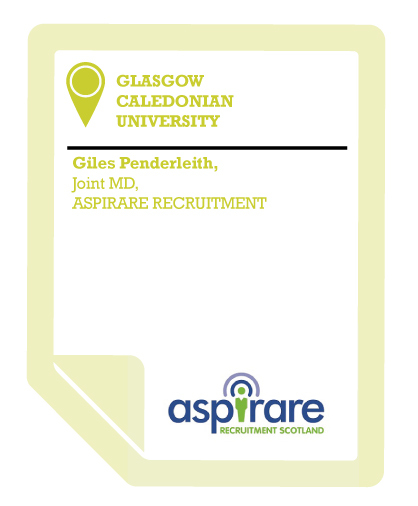 Aspirare is a professional and technical recruitment company – we place professional and technical roles within the engineering, oil and gas, IT, banking and finance sectors. There is a real skill shortage in these areas [the areas we work in] so we engage with a lot of universities to try to plug these gaps and transfer our knowledge within the student community. There is huge financial commitment by the graduate when embarking on their education and we support some of the graduate community to develop self-awareness with our talent reports. I was really impressed actually by Glasgow Caledonian University. Their employer engagement team are very entrepreneurial in their way of thinking and how they go about things. They produce a lot of creative and unique ideas and solutions that they are driving forward which really differentiates them from other universities that I have had experience of. Particularly helpful has been GCU’s educational based seminars, putting on programmes, bringing employers in and talking about the dos and don’ts of what you should be concentrating on as a student and graduate. That works really well. Bridging the gap between academia and the corporate world adds huge value. The University has real energy and passion for their graduates, especially in the careers service. Their enthusiasm to be creative, to do better and to add more value, not just stagnating and going with the flow, seem to be dynamic in terms of moving things forward. I engage with quite a lot of universities and I don’t expect to see that new stuff coming through. It was good to see that. There’d be no reservations at all in recommending other businesses to get involved with universities in this way, and with GCU in particular. We’re actually setting up a project at the moment that a team of graduates are going to be assisting us with and there’s going to be a competition with an award for the team who gets the best results. We always speak very highly of GCU and refer on. There is a lot of value there, particularly with their experience of both academia and the commercial world as well. Their careers team are results oriented.